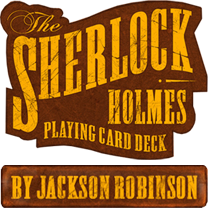 Addon Calculator for Jackson Robinson's Sherlock Holmes Playing Card Kickstarter project. The Game is Afoot - This tier will get you one of everything in the Sherlock Project. 1x LE Baker Street, 1x Baker Street, 1x Holmes Edition, 1x Moriarty Editions, 1 Hound of the Baskervilles, 1x Baker Street Uncut, 1x Holmes Uncut, 1x Moriarty Uncut, 1x Hound Uncut. 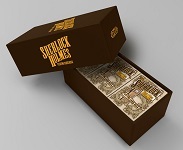 1x Sherlock Holmes dealer coin, 1x Sherlock Holmes Brick Box, 1x Sherlock Holmes Poster. 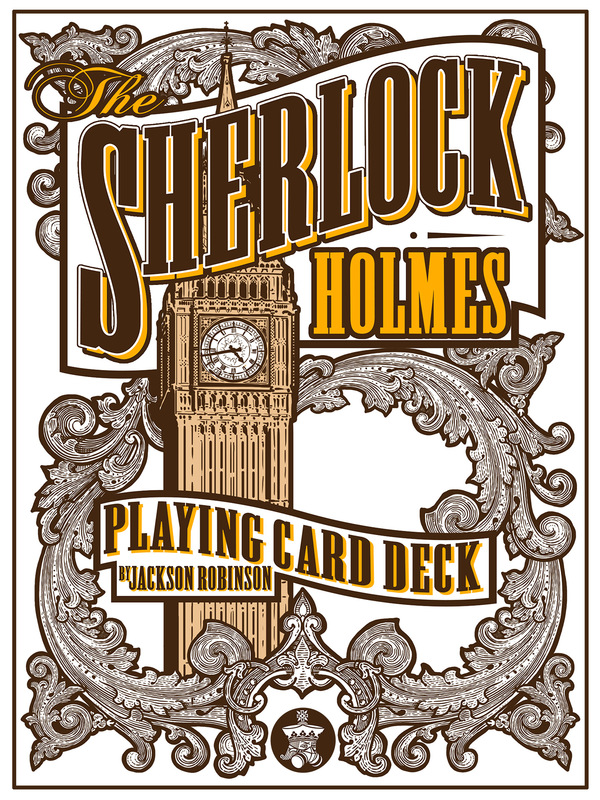 A1 - 1x Baker Street Edition Deck. Shipping is included for all US Backers. Int. Backers be sure to add $9 to your pledge for shipping. B1 - 1x Holmes Edition Deck. Shipping is included for all US Backers. Int. Backers be sure to add $9 to your pledge for shipping. C1 - 1x Moriarty Edition Deck. Shipping is included for all US Backers. Int. Backers be sure to add $9 to your pledge for shipping. H1 - 1x Hound of the Baskervilles Deck. Shipping is included for all US Backers. Int. Backers be sure to add $9 to your pledge for shipping. 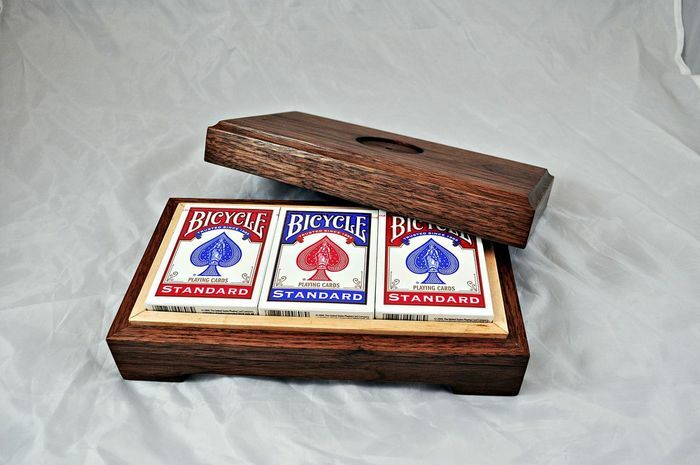 A2 - 1x Limited Edition Baker Street Deck. Int. Backers be sure to add $9 to your pledge for shipping. 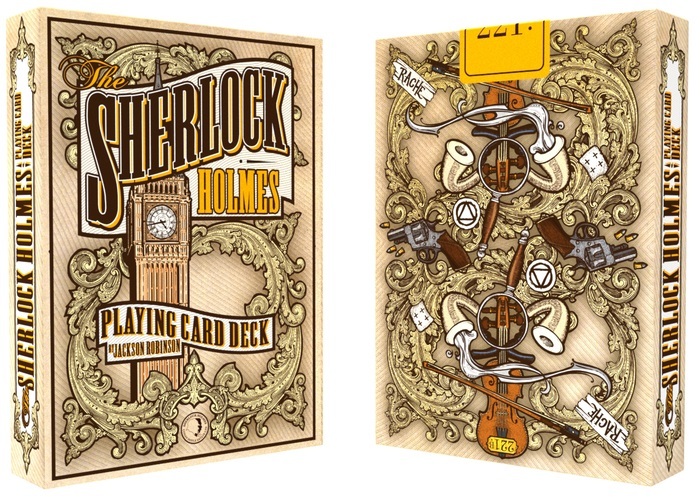 D1 - 1x Baker Street Edition Deck, 1x Holmes Edition Deck, 1x Moriarty Edition Deck. Shipping is included for all US Backers. Int. Backers be sure to add $14 to your pledge for shipping. Sign of Four - 2 x LE Baker Street, 2 x Baker Street, 3 x Hound of Baskervilles, 3 x Holmes, 2 x Moriarty. Int. Backers be sure to add $30 to your pledge for shipping. 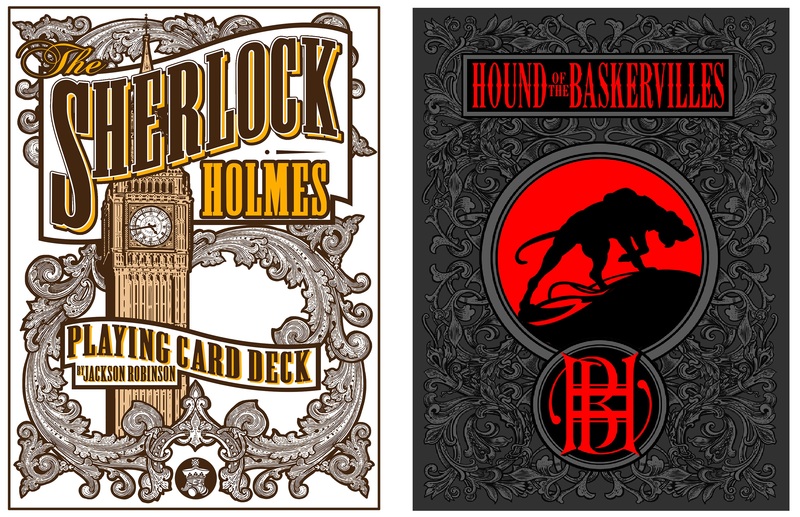 D2 - 1x Baker Street Edition Deck, 1x Hound of the Baskervilles Deck, 1x Holmes Edition Deck, 1x Moriarty Edition Deck. Shipping is included for all US Backers. Int. Backers be sure to add $17 to your pledge for shipping. A3 - 2x Limited Edition Baker Street Decks. Int. Backers be sure to add $12 to your pledge for shipping. E1 - One of everything. 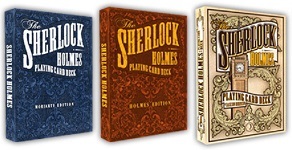 1x Limited Edition Baker Street Deck, 1x Regular Baker Street Edition Deck, 1x Holmes Edition Deck, 1x Moriarty Edition Deck. Int. Backers be sure to add $17 to your pledge for shipping. E2 - Two of everything. 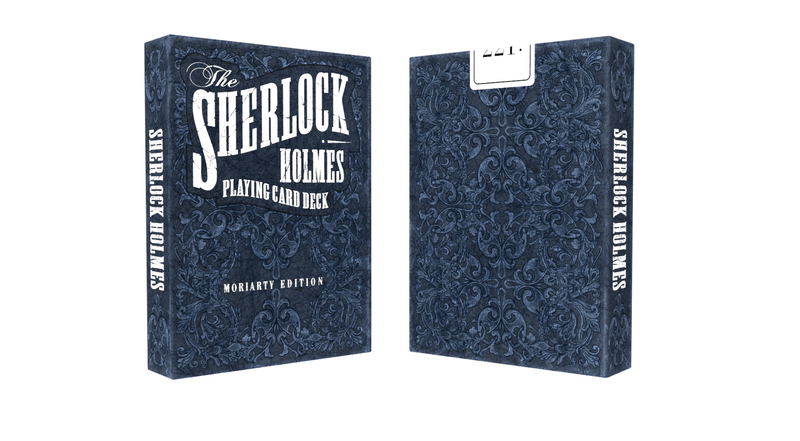 2x Limited Edition Baker Street Deck, 2x Regular Baker Street Edition Deck, 2x Holmes Edition Deck, 2x Moriarty Edition Deck. Int. Backers be sure to add $22 to your pledge for shipping. 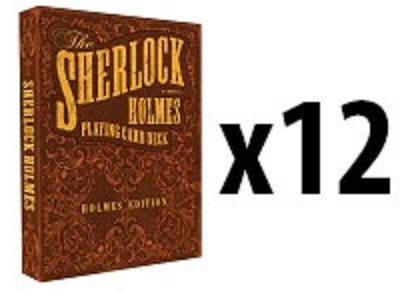 F1 - Assorted Sherlock Holmes Brick (12 Decks). Tier Includes 4x Baker Street Editions, 4x Holmes Editions, 4x Moriarty Editions. 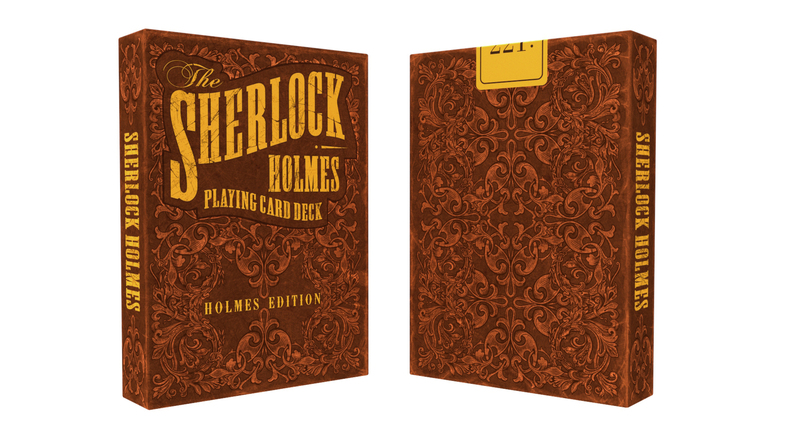 This tier does not include the Limited Edition Baker Street Deck. Int. Backers be sure to add $30 to your pledge for shipping. F2 - Sherlock Brick (12 Decks). 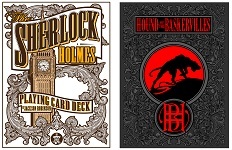 Tier Includes 3x Baker Street Editions, 3x Hound of Baskervilles Decks, 3x Holmes Editions, 3x Moriarty Editions. This tier does not include the Limited Edition Baker Street Deck. Int. Backers be sure to add $30 to your pledge for shipping. 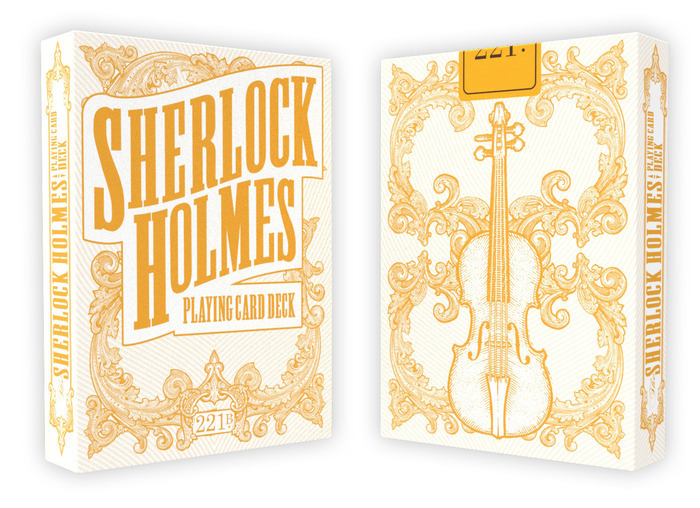 G1 - EARLY BIRD -Limited Edition Assorted Sherlock Holmes Brick (12 Decks). 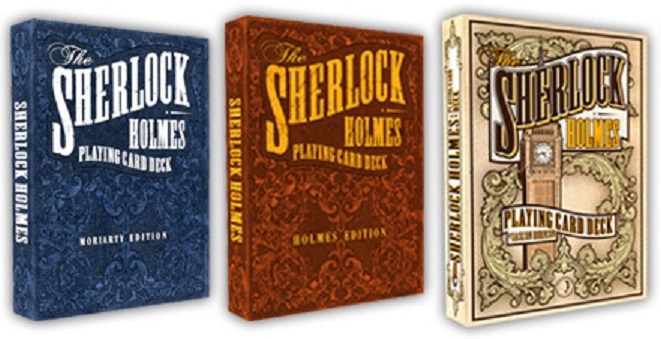 Tier includes 2x Limited Edition Baker Street Editions, 2x Regular Baker Street Editions, 4x Holmes Editions and 4x Moriarty Editions. Int. Backers be sure to add $30 to your pledge for shipping. G1 - Limited Edtion Assorted Sherlock Holmes Brick (12 Decks). 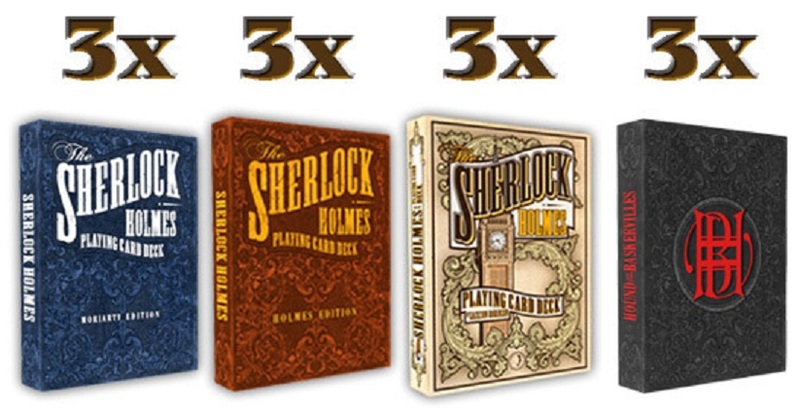 Tier includes 2x Limited Edition Baker Street Editions, 2x Regular Baker Street Editions, 4x Holmes Editions and 4x Moriarty Editions. Int. Backers be sure to add $30 to your pledge for shipping. 1x Limited Edition, Hand made Sherlock Holmes 4 deck wooden case with an inlayed antiqued gold finished Sherlock Holmes Medallion. 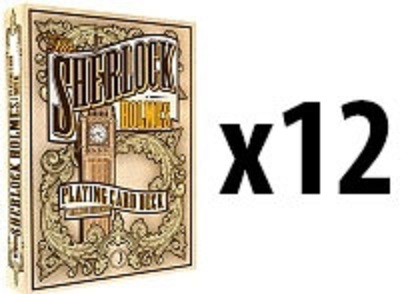 Pledge tier also includes 2x LE Baker Street Edition Decks, 2x Baker Street Decks, 2x Hound Decks, 2x Moriarty Edition Decks, 2x Holmes Edition Decks. Baker Street Deck. Shipping is included for all US Backers. Int. Backers shipping varies based on total number of decks shipped. 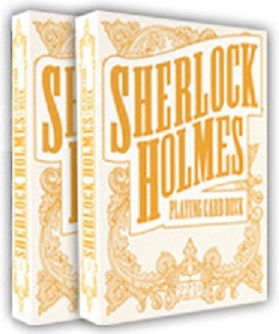 Holmes Edition Deck. Shipping is included for all US Backers. Int. Backers shipping varies based on total number of decks shipped. Moriarty Deck. Shipping is included for all US Backers. Int. Backers shipping varies based on total number of decks shipped. Hound of Baskervilles deck. Shipping is included for all US Backers. Int. Backers shipping varies based on total number of decks shipped. 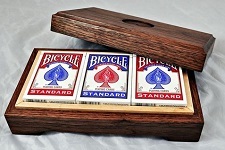 Baker Street Edition Brick (12 decks). Shipping is included for all US Backers. Int. Backers be sure to add $30 to your pledge for shipping. 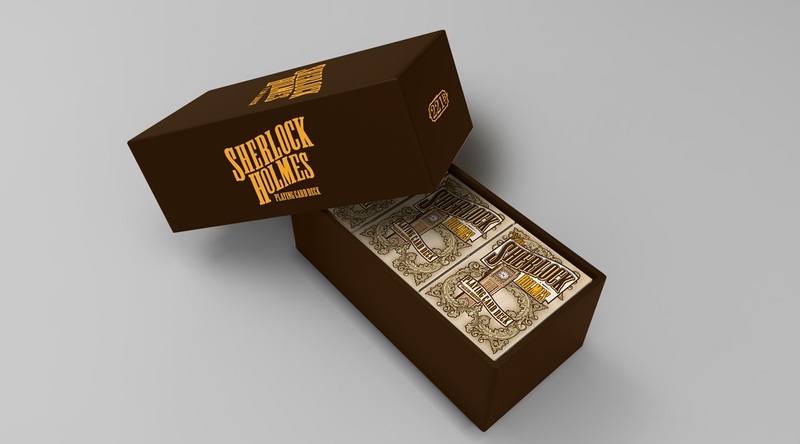 Holmes Edition Brick (12 decks). Shipping is included for all US Backers. Int. Backers be sure to add $30 to your pledge for shipping. 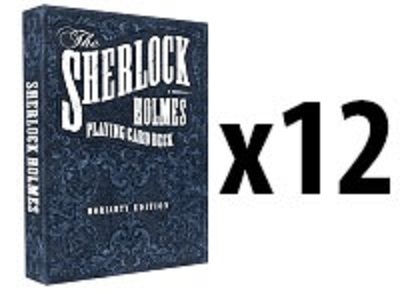 Moriarty Edition Brick (12 decks). Shipping is included for all US Backers. Int. Backers be sure to add $30 to your pledge for shipping. 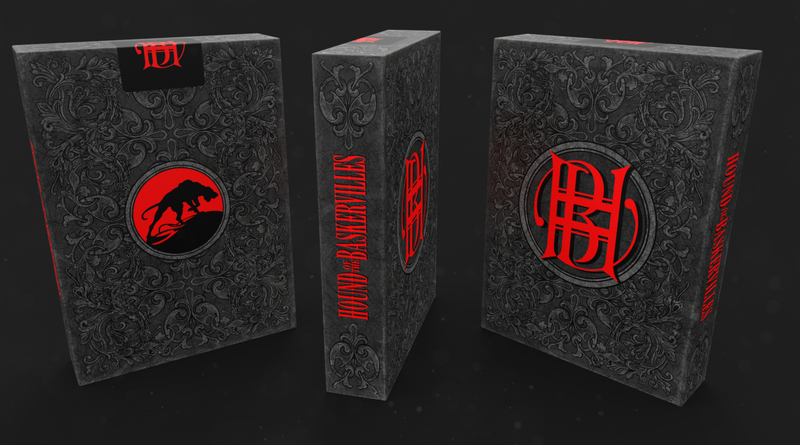 Hound of Baskervilles Brick (12 decks). Shipping is included for all US Backers. Int. Backers shipping varies based on total number of decks shipped. Baker Street Edition Uncut Sheet. Shipping is included for all US Backers. Int. Backers be sure to add $15 to your pledge for shipping. 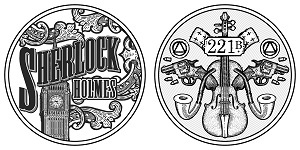 Holmes Edition Uncut Sheet. Shipping is included for all US Backers. Int. Backers be sure to add $15 to your pledge for shipping. Moriarty Edition Uncut Sheet. Shipping is included for all US Backers. Int. Backers be sure to add $15 to your pledge for shipping. Hound of Baskervilles Uncut Sheet. Shipping is included for all US Backers. Int. Backers be sure to add $15 to your pledge for shipping. 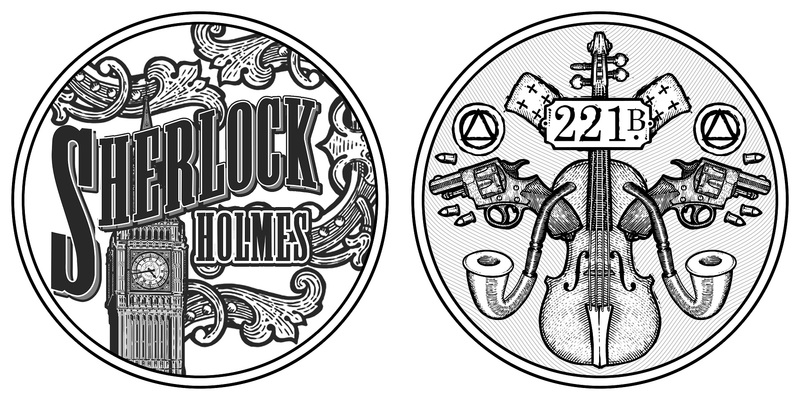 Sherlock Holmes Dealer Coin. Shipping is included for all US Backers. Int. Backers be sure to add $2 to your pledge for shipping. Sherlock Holmes Collector's Brick Box. Does not include any decks. Shipping is included for all US Backers. Int. Backers be sure to add $15 to your pledge for shipping. Signed and Numbered Sherlock Holmes Screen Printed Poster. The poster will be a 18" x 24" 3 color design printed by the same crew that has printed all of my posters. Shipping is included for all US Backers. Int. Backers be sure to add $15 to your pledge for shipping. 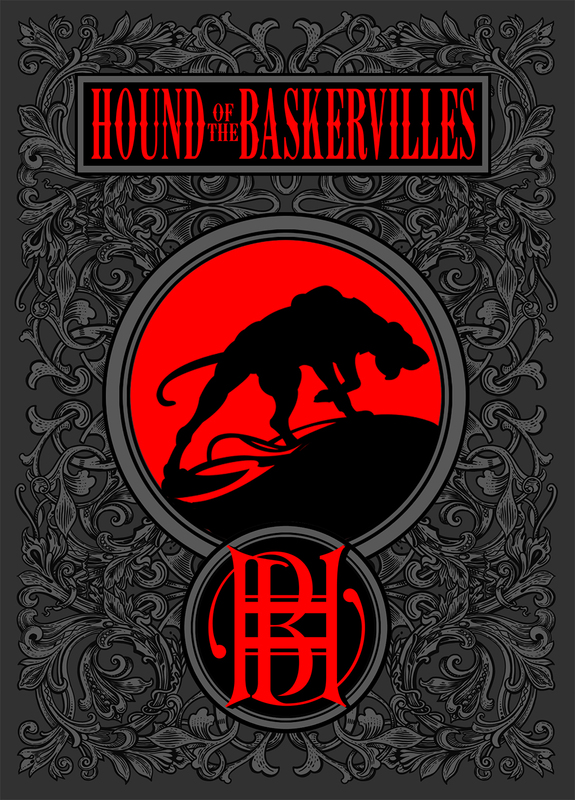 Signed and Numbered Hound of Baskervilles Screen Printed Poster. The poster will be a 18" x 24" 3 color design printed by the same crew that has printed all of my posters. Shipping is included for all US Backers. Int. Backers be sure to add $15 to your pledge for shipping. Signed and Numbered Sherlock Holmes Screen Printed Poster and a Signed and a Numbered Hound of Baskervilles Screen Printed Poster. The posters will be a 18" x 24" 3 color design printed by the same crew that has printed all of my posters. Shipping is included for all US Backers. Int. Backers be sure to add $15 to your pledge for shipping.